My parents were attending a company party and had arranged for me to stay overnight at Aunty M’s. I was a picky eater at the time. I don’t remember what she made for dinner or for breakfast the next morning. I think my parents were supposed to pick me up after breakfast but were delayed. Anyway, as lunch time approached, Aunty M started to make grilled cheese sandwiches for her children (my cousins). She said she would make me for lunch to try. I never tasted cheese before much less grilled cheese (for reasons that will take to long and send me back into therapy, just kidding). She said to at least try it. I’m not sure if she was practicing tough love or what, but she said that grilled cheese sandwiches was all she was making, so the only choice was to eat or not to eat. She wasn’t going to make something just for me (not that I was asking). I was intrigued. I helped her butter the bread on the outside and watched her fry them on the frying pan. This was not some sort of gourmet sandwich with artisanal cheeses and breads. This was plain white bread and American cheese. The smell of the melting butter and cheese was unfamiliar but somehow comforting. With a bit of apprehension, I took my first bite. It was like the heavens opened up and the angels started to sing, watching color television for the first time, you get the idea. The bread was buttery, toasty, and crunchy. Inside, the cheese was gooey and salty. WOW! I think she even gave me some of the cheese that melted on the pan and got crusty. This was the greatest thing since sliced bread. That incident made me look at food differently. If I hadn’t encountered it before, at least I will give it a try. There are some foods that are still too weird for me, but I am more open to the adventure. I don’t eat cheese as much as I would like to because of lactose intolerance issues that occurred later in life (sorry, too much information). I think because of a grilled cheese sandwich, I was able to tackle the chicken feet. Initially, there was trauma and drama, but at least I didn’t go running out of the house screaming. They say that a journey begins with the first step. 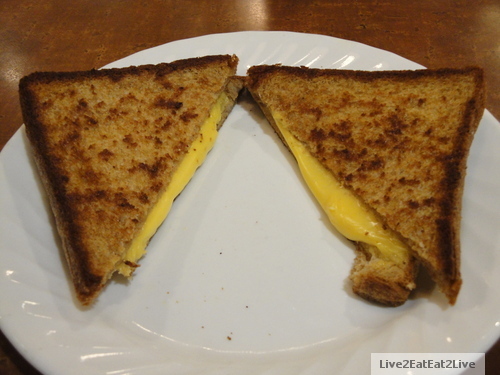 My journey of eating began with a grilled cheese sandwich! Toasted cheese is a great idea for breakfast! It is so easy to prepare but very tasty! I like the way your Auntie M works kids! when we traveled with our children, we always had at least one meal that was the “food of the area.” ie, lobster in Maine, Mexican food in Texas, shrimp and grits in South Carolina. Our seven year old was our picky eater. At the fine Mexican restaruant in Dallas, she looked at the menu and ordered an egg sandwich—said that was the only food she could identify from the menu.. Today, they all enjoy all types of food and all are good cooks. And our Sunday evening supper in the winter time is still grilled cheese sandwiches and Campbell’s tomato soup. This is such a great story, about a great sandwich. I think I’ll go out and get some cheese to make one! I love your blog and look foeqard to reading more. Hi! That was a great read! Made me smile, hungry, happy all at the same time. You have such an affection for food and such a light way of writing about it. Thanks. A writer friend told me just to be my weird and quirky self. Always looking for the next great meal. Eat well. Toasted cheese is the answer to world peace, every time I have one. Wouldn’t the world be a better place? Thanks for commenting. Have a Hoppy Easter weekend. Eat well. Thanks for stopping in. I still remember it. Mostly because it opened my eyes to eating new foods (at least to try once). Eat well. Nice post.” Trauma and drama….” –thanks for letting me smile! Thanks for dropping in. Have a good weekend. Eat well. The cheese sandwich looks very good. Thanks for liking my post about the traffic cop. I love grilled cheese so much I actually stole some from a baby once. Long story. I love to hear stories about how family influences how we view food. Wonderfully entertaining! … its a lot of fat and salt, which our tastebuds like. You have a delightful sense of humor. My way of thanking my aunt. One of my early teachers in trying new things (especially food). Thanks for stopping by. Yep. The mouse likes cheese. Have a good weekend. I can also relate. Maybe grilled cheese sandwiches — plain, down home, simple — should be made & served at all international, diplomatic events…… could change the course of everyone’s history! Grilled cheese and tomato soup. Who knew that’s the key to whirled peas. 🙂 Thanks for stopping by. Have a good weekend. = ) so thanks for a very wonderful post! Kudos! The pleasure is mine = ) And I would; I would really do; I love to! Have a great day! Looks good – melted cheese and anything fried in butter is always good 🙂 I don’t think I can eat soup without grilled cheese. Hey Spencer that was pretty good.